Eggs are an excellent source of protein, vitamins, and iodine. They also find innumerable applications in cooking, thus providing a variety to the diet. The most commonly consumed eggs are those produced by the hen. Quale and duck eggs are also some other options. Scientists and researchers over the centuries have brought about several innovations with eggs as we find in the market. One of these is "vegetarian eggs." 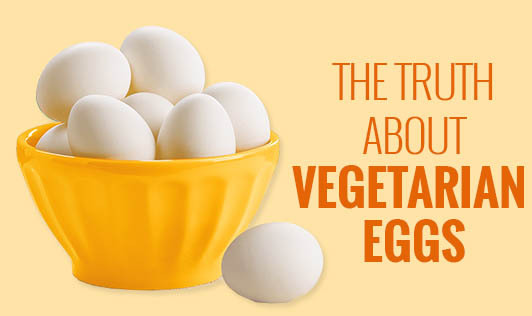 It is a popular myth that vegetarian eggs are termed so because they do not possess the capacity to fertilize. But the truth is that vegetarian eggs are claimed to be "vegetarian" because the feed provided to the hens is of plant origin instead of the usual worms and insects. This also minimizes the nutrient content of the eggs since feeds of plant origin lack proteins, vitamin B12, iron, and luteins. However, to overcome this drawback, there are vegetarian brown eggs as well, fortified with these nutrients. The good thing about vegetarian eggs is that plant feeds do not contain plant wastes and byproducts unlike animal feeds. Chickens feed on animal feed as well as wastes generated by other chickens and this can lead to spongiform diseases. These diseases can also be transmitted to other chickens as well as to humans through the eggs also called "cannibalism." Vegetarian eggs hence must be an option for those who have no objections to the fact that these eggs can fertilize. However, there are also chances that plant feeds in the open may have certain worms/insects in them depending on the quality, source, and location of the feed, the surrounding environment and sanitation. Manufacturers are required to term such eggs as "free-range eggs" but most food labels claim these eggs also to be vegetarian. Vegetarian eggs can also come from battery hens. Those opting for vegetarian eggs as a result of sentiments towards animal welfare must know that battery hens are put into battery cages where they have no space to even do so much as turn around. These cages are very small in size and long durations of exposure to these cages can cause stress responses amongst chickens due to which they can sometimes attack each other. There can also be chances of bacterial contamination. Off late, many animal welfare groups have been protesting against these practices and several nations have also banned the use of such cages.